This mod adds a spawnable straw golem. It's a very weak golem and flees whenever hostile mobs come nearby, but it can harvest full grown crops (however it can't pick up drop). For more info and for a Getting Started guide, check out the wiki! 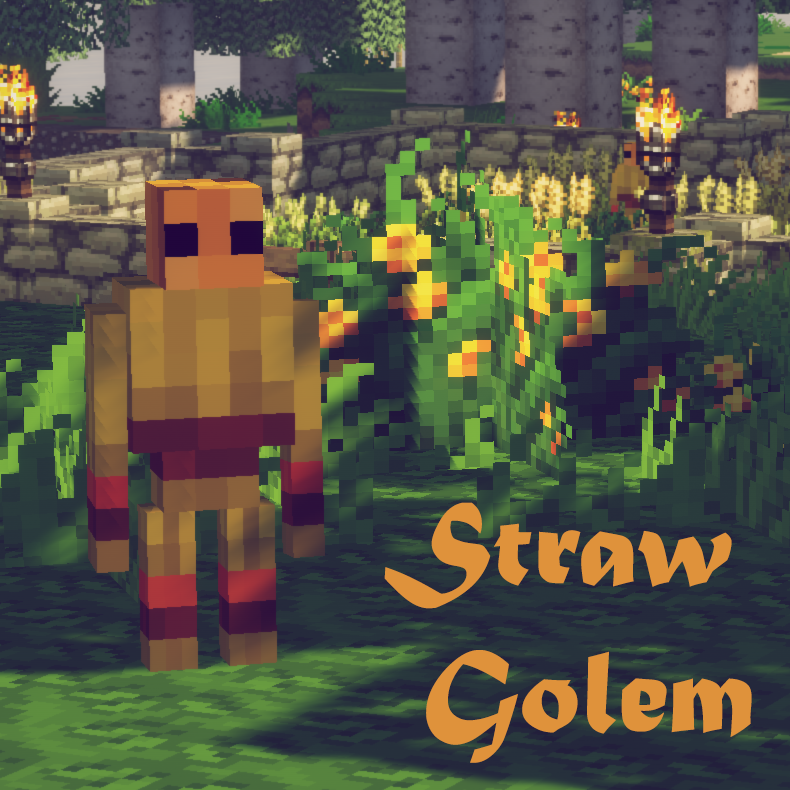 Is Straw Golem compatible with *a mod that adds crops*? Pam's HarvestCraft is compatible as far as I've tested. Mystical Agriculture is compatible as far as I've tested. PizzaCraft is compatible, but the right-click-to-harvest feature is not working. There is a right-click-to-harvest like feature? Yes, there is. The Auto Replant flag does that. However, this feature doesn't simulate a player right click, but it simply replants the same crop where it had harvested it (obviously with age set to minimum). Check this wiki for more info. For now, I'll not implement a feature that simulates a right click because is useful only for very few mods. Thanks to Akhenaten (kcobolt) for the logo! Flowstone - Changes the result when lava and water meet. Nope, no porting for older versions, I'm sorry but I've not enough time for that. Wow, thank you! Can I add a link to (or an embedded player with) your video to this mod's description? I love your mod, so cute!!! Eventually I would love to see more mini little helper Golems! Maybe a miner Golem next? I'll not add other golems to this mod, 'cause I like little mods that do only one thing. That said I could develop another golem mod, but it's hard to not make a miner golem overpowered. Just a golem that digs vertically in a 3x3 area (or even in a 1x1) is very powerful... When I'll find a solution to this problem that suits me, I'll develop a miner golem mod or a lumberjack golems mod or a fisher golem mod or whatsoever. also maybe a way to heal them would be beneficial as them dying so often hurts my soul. Anyway I just love your mod and will always support it. Thanks! Straw golems have only one life point (one half-heart) and an expiration time of about one in-game week, that's why they die so often, you have to protect them in some way! There already are vanilla Iron Golems that attack enemies, so I will probably not create warrior golems. The straw golems can harvest nether wart too (if I remember correctly), so no need for a soul golem. The other ideas are awesome, especially the Lamp Golem and the Atlas Golem, I think I'll go to develop one of those (or both) as soon as I have some free time! ahh sorry the format stuffed up when I posted. I was just thinking a little warrior golem would be cool because it could be earlier game and wouldn't get in the way so much (plus it's cute.) But I respect your decision. Thanks so much for your consideration though, those ideas have been in my head for a while and I was glad to share them!!! There is a request - to give the opportunity to disable or lure the golem over the fence! And about that request, I'll think about a feature for limiting/control a golem activity, it may be in the next release (maybe I could use leads...). If you want to limit it, a lifespan is probably the way to go, imo. Thank you, I'm surprised that someone had actually read the F.A.Q. And about the lifespan, it will be in the next release for sure. Hopefully, that release will come up soon. Hello,I'm Chinese player.Can I share your mod to mcbbs?A Chinese minecraft forum.